Looking for ways to strengthen your immune system? Good idea for staying well at this time of year. According to WebMD, “A diet rich in antioxidant vitamins and nutrients can boost immunity. Top antioxidants include vitamins C and E, plus beta-carotene and zinc.” Their top antioxidant food picks include kale, onions, spinach, carrots, chard, and garlic. And that’s pretty much the ingredient list for this soup. So it’s healthy, but the real surprise is its savory deliciousness, considering its simple ingredients. Preparation method is key. 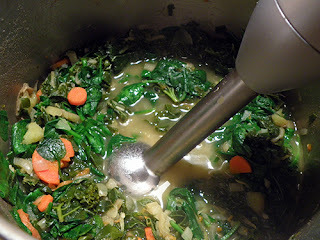 As my friend Gwen, who makes this soup every winter says, “If you throw it all into a pot, it won't come out right. Follow instructions, then it's delicious!” Luckily, the instructions are pretty easy. This recipe is from Field of Greens, the second cookbook from Greens Restaurant, a San Francisco institution since 1979, where chef Annie Sommerville still works her magic. Greens is said to be the first successful vegetarian restaurant both in customer satisfaction and in business viability. In other words, Greens was the first restaurant to make vegetarian fare delicious and varied enough for customers to return again and again. This soup proves their premise that delightful flavors can come from simple vegetables prepared right. 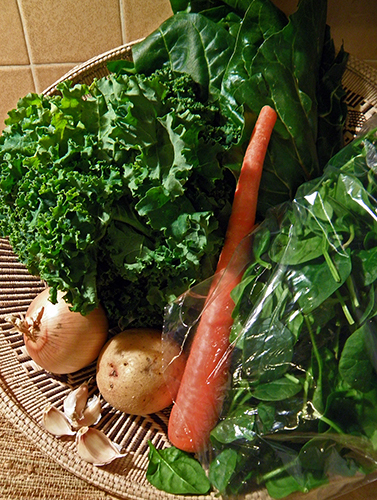 The main ingredient, of course, is winter greens: chard, kale, and spinach. While the recipe calls for 8 cups (packed) of each, sizes of bunches can vary. As long as you end up with about 24 cups when you start (it shrinks down when cooked! ), a little variation in amounts of each is acceptable. I’ve adjusted the amount of oil. In my stainless steel soup pot, 1 tbsp. wasn’t quite enough to keep the onions from browning. Try to use as little as possible, but don’t risk burning. The onion quantity in the original recipe seemed a bit off; 3 cups of thin slices from one large onion seems like a lot. I happened to have some shallots on hand from our CSA, so added those to make the 3 cups. You could also choose to add another onion, or a different type of onion. 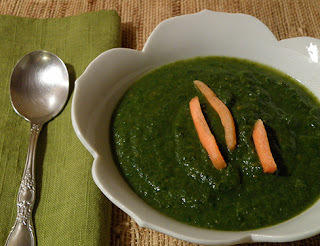 The quantity of salt in the original recipe seemed high, but Greens doubtlessly uses unsalted soup stock. If there’s salt in your stock, start with the smaller quantity. I prefer grey salt in soups for best flavor and added minerals. Because I like lemon in soup, I increased the amount from1 to 3 tablespoons. Let your tastebuds be your guide. Greens sometimes adds garden sorrel before pureeing, to add to the lemon flavor. 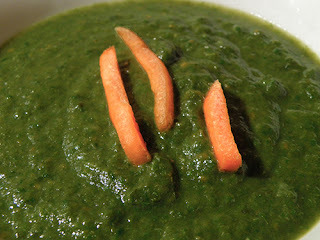 Although Field of Greens (published in 1993) advises pureeing the soup in a blender or food processor, these days an immersion blender is handier. Not only does it create less mess, pureeing right in the pot keeps the soup hotter, while keeping the hot stuff away from the chef. Various garnishes can be added to the soup when it’s served. Gwen’s family likes parmesan croutons or bacon crumbles. I liked a bit of grated Parmesan cheese, and/or a few carrot curls. Field of Greens recommends garlic croutons (recipe in book) and Parmesan. This soup is extremely flavorful with no garnish at all, but it’s soooo green-looking that you might want to throw something on top just for a bit of contrast. Thinly slice onions and shallots. You will have almost 3 cups. Chop garlic finely. Slice potato and carrot thinly. Remove stems from chard and slice thinly. You will have about 1 cup. You can combine the potato, carrot, and chard stems in one container. Tear up chard leaves into medium pieces. Remove stems from kale and discard. Tear up kale leaves. Wash spinach thoroughly and remove stems, unless using baby spinach. You will have about 8 cups packed leaves for each green, or 24 cups total. Keep spinach separated from chard and kale. Heat up the stock and keep warm over low heat. Heat the olive oil in an 8-quart soup pot. Start with 1 tbsp. oil and add more if needed. Add onions, ¼ - ½ tsp. salt and several pinches of pepper. Sauté over medium heat, stirring frequently, until the onion is soft, about 5 - 7 minutes. Add garlic, chard stems, potatoes and carrots. Sauté and stir until the vegetables are completely heated and coated with oil, about 5 minutes. Add ½ cup stock, cover the pot, and simmer for about 10 minutes, stirring frequently. When the vegetables are tender, stir in white wine. Uncover pot and simmer for 2 - 3 minutes, stirring frequently, until most of liquid has evaporated. You might need to increase the heat. 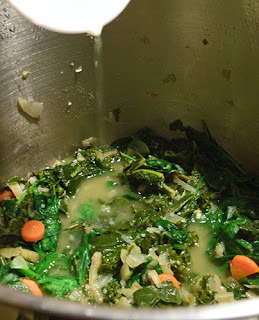 Add the kale, chard leaves, ½ -1 tsp. salt, a few more pinches of pepper, and three cups stock. Press greens down into liquid as much as possible. Reduce heat to medium low. Cover the pot and cook the soup until greens are tender, about 10 - 15 minutes, stirring up from the bottom every few minutes until all greens are cooked down enough to be submerged in liquid. Add the spinach. 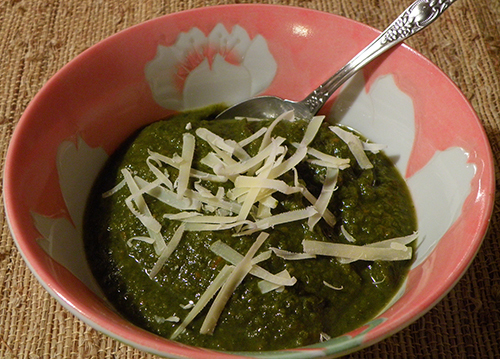 Simmer for 3 - 5 minutes, stirring frequently, until spinach is just wilted (2 – 3 minutes for baby spinach). Remove from heat. Stir in lemon juice. Taste and adjust salt and pepper. Puree the soup with an immersion blender until as smooth as you like. Thin with a little more stock if you like. Garnish with carrot curls, Parmesan cheese, croutons, and/or bacon crumbles. I'm excited to make this! Thanks for posting. Look at the color is just so eye pleasing. I think this is very healthy dish and best to have in winter and yes its very easy too.